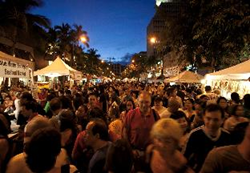 15 food vendors, two entertainment stages and local retailers join Waikiki’s most popular street festival on April 30, 2016. Thousands of people will gather along Kalakaua Avenue for a unique street festival that celebrates Hawaii’s love of the iconic SPAM® brand. More than 25,000 festivalgoers are expected to attend the 14th Annual Waikiki SPAM JAM® Festival, which is presented by Outrigger Hotels and Resorts, to enjoy specialty dishes prepared by some of Hawaii’s favorite local restaurants, SPAM® merchandise, island crafts and more on Saturday, April 30, from 4 - 10 p.m.
As the presenting sponsor of the 14th Annual Waikiki SPAM JAM® Festival, Outrigger Resorts and OHANA Hotels in Waikiki will be offering guests checking in for the weekend a free one-category upgrade, based on availability, with the donation of a can of SPAM® product, which is then donated to the Hawaii Foodbank. For reservations, visit http://www.outrigger.com, or call 1-800-688-7444 and ask for the best available rate. This offer is subject to change and availability. Some restrictions apply. Those who attend the Waikiki SPAM JAM® Festival can look forward to a wide selection of delicious local cuisine from 15 participating restaurants that will each serve up tasty dishes, with at least one menu item featuring a SPAM® meat product. This year’s grand-prize winning recipe from the Great American SPAM® Championship, the Gemütlichkeit (guh-MOOT-luh-kite) SPAM®wich, will be available at the Hula Grill Waikiki food tent. The Gemütlichkeit SPAM®wich recipe, which consists of panko-crusted slices of SPAM® with bacon, sautéed and stacked on a Milwaukee pretzel bun and topped with classic, warm cabbage slaw and mustard, was cooked up by Wisconsin resident Lisa Dziadulewicz. Lisa’s creative, German-inspired recipe bested 26 other finalists nationwide, winning her a grand prize, all-expense paid trip for two to this year’s Waikiki SPAM JAM® Festival. In addition to the delicious cuisine, Outrigger Resorts’ popular photo booth with a wave made up of SPAM® brand cans is back, bigger and better than last year, for fun photo opportunities. SPAM® merchandise, island crafts and locally made products will be available for sale. The evening will also include live entertainment on two musical stages, each featuring a line-up of top island artists. Admission to the event is free and all proceeds generated benefit the Hawaii Foodbank and other local charities, including the Waikiki Community Center and Visitor Aloha Society. There are several ways to stay on top of the latest details of this year’s Waikiki SPAM JAM® Festival: visit SPAMjamhawaii.com or join the Waikiki SPAM JAM® Festival social community on Twitter: @SPAMjam or Instagram: @waikikiSPAMjam.